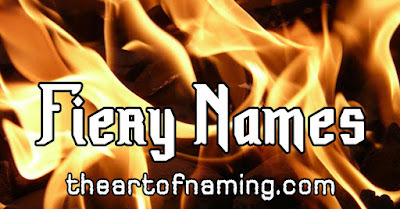 The Art of Naming: Aidan, Ignatius & Seraphina: Hot Names Inspired By Fire! Aidan, Ignatius & Seraphina: Hot Names Inspired By Fire! Today we will be exploring one of the most powerful things in nature: fire. Whether it is controlled in a fireplace or a bonfire, or raging out of control in destructive ways, it is hard to deny that fire is exciting. However, staring into the mesmerizing, continuous flicker of flames from a safe distance on a cool night might be one of the best ways to experience this phenomenon, especially if you have some marshmallows. You may be wondering which names are the fieriest. Perhaps the most popular name with a fiery meaning is Aidan. The name Aidan comes from a sizable family tree of related names. The original Ancient Irish name was Áed meaning "fire". From that name came names like Áedán, Aodh, Aodhán and today's variations of Aidan such as Aiden, Aydan, Ayden and so on. The name Aodh, pronounced EE or AY, was very popular in early Ireland. It was used by many different figures in Irish mythology as well as several kings. Interestingly, Aodh was traditionally anglicized as the name Hugh rather than any of the Aidans. Aidan's distant cousin is the name Keegan by way of the diminutive name Aodhagán turning into the surname Mac Aodhagáin. There's also the Scottish Iagan and Edan. 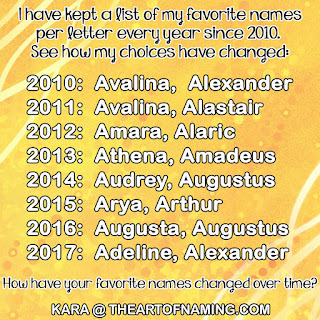 More or less, all of these names mean "fire" or descendant of the fiery one, at least. Like I said, Aidan is very popular. I'm sure many of you are tired of this name and its soundalikes such as Braden, Cayden, Hayden, etc. That's probably because of how incredibly fast this name rose from out of nowhere. It wasn't even used in the US until 1957. It didn't rank in the Top 1000 until 1990 at #889. Suddenly, by the year 2003 there were over 10k boys given the name for a rank of #39. However, it was actually the spelling Aiden with an E that was vastly more popular. It rose slower than Aidan but has hung on longer. It had half the popularity of Aidan in 2003, but climbed the charts while Aidan declined. Aiden's peak came in 2009 with exactly 16,000 births and a rank of #12. But it went on to rank higher at #9 in 2010 and 2011 with slightly fewer births per year. Currently, Aidan ranks at #187 in 2014 while Aiden holds steady at #14. They are both finally overstaying their welcome a bit and creeping back down the charts. Which spelling do you prefer? This name can refer to the residue of a fire, but it is more typically associated with the Ash Tree or it is simply a short form of names like Ashley, Asher or Ashton. However, it has to be noted that these longer forms don't have meanings having to do with fire. Ash was first regularly given to boys as a name in the US in 1996. Most parents probably prefer longer forms of the name since Ash has never been popular on its own. There were a record-high 66 male births in 2014. Would you ever use Ash on its own? Do you like any of the longer forms? Blaze is an English word meaning "a very large or fiercely burning fire". As a name, though, it is a modern variation of Blaise. Even though these two names are technically related and share a pronunciation, Blaise has nothing to do with fire since it is a Roman name meaning "lisping". Blaze popped up in the US as a boy name in 1953. While it has never been popular, it entered the Top 1000 in 2000 and currently resides at #775 fourteen years later. Blaze could be a more edgy alternative to Blake. Ember is an English word meaning "a small piece of burning or glowing coal or wood in a dying fire." As a name, Americans have used it since 1946 but it never has much steam until recently. It entered the Top 1000 in 2009 and shot all the way up to #435 in 2014. Even though embers are a dying fire, the name Ember is glowing brightly. It is very similar in sound to the name Amber which was huge in the 1980s-1990s, ranking as high as #13 in 1986. Since Amber's popularity is starting to fall, perhaps Ember is rising to take her place. If that seems like a stretch, though, Ember is also very close in sound to other popular Em- names such as #1 names Emma and Emily. Ember could be similar enough to those yet unique enough to be catching parents' attention today. A flint is a hard stone with which one could start a fire if the stone is struck hard enough. As a name, Flint comes from the Old High German word flins and usually refers to a dark stone made of the mineral quartz. Since it is a hard stone, it has been used in the past as a nickname for a tough guy. Flint might immediately bring to mind the cartoon character Fred Flintstone. But also, with the recent news out of Flint, Michigan concerning the toxic water scandal, Flint might not currently be a name you want at the top of your shortlist. Now that Ignatius means fire, it is certainly a red-hot choice for bold namers. It is used well internationally under various translations, but here in the US, it remains rare. Ignatius was only given to 40 boys in 2014. Of course the Phoenix is perhaps the most beautiful image aside from fire itself. The immortal bird from Egyptian and Greek mythology is known for being consumed by fire and then rising from its own ashes every 500 years. The Greek word phoinix actually means "dark red". In other English-speaking countries, Phoenix is mostly used for boys, but here in America, this name is hot for both genders as both a mythological name and a place name for the capital of Arizona. It was given to girls first but caught on more quickly for boys. For boys, it entered the Top 1000 in 1995; girls followed in 2003. Here's 2014's stats: 59% boy / 41% girl. Boys: 901 births (#355). Girls: 629 births (#494). Which gender do you prefer? The lovely, underused Seraphina comes from the biblical word seraphim that means "fiery ones" and refers to an order of angels. It is rather surprising that this name has never caught on. Even more surprising is that it was never used in the US before 1981. Even today, Seraphina is nowhere near the Top 1000. In 2014, there were only 175 girls given this name. Do you think it'll blaze up the charts someday or remain forever uncommon? Tyson is an English surname that is said to mean "firebrand" based on the Old French word tison. In the past it has also been used as a nickname for a quarrelsome person. This name has been around in the US since 1912, It never ranked all that well until it joined the Top 1000 in 1966. It ranked well through the 1980s but declined again in the 90s. Tyson peaked in popularity in 2009 with nearly 1,500 births for the year and a rank of #237. These days it's down to #282. What do you think, is the name Tyson hot or not? So what do you think of these fiery names? Can you think of any that I missed?